When you think of eating healthy, the first thing that may come to mind is the Food Pyramid. While some of the same basic principles still hold true, the Food Pyramid is outdated. 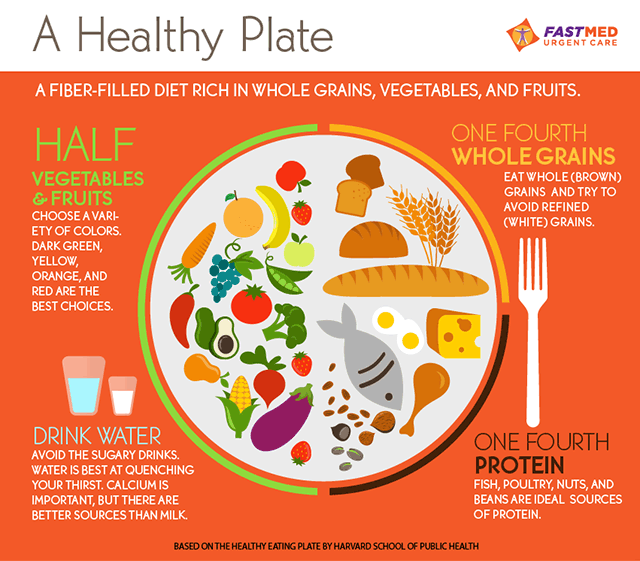 Today, we believe that the best way to visualize a well-balanced meal is by showing it the way you eat it…on a plate! As you might guess, fruits and vegetables are extremely important. They should make up about half of any meal that you eat. The other half should be made up of equal parts whole grains and healthy proteins. Finally, don’t forget to drink plenty of water. Most people need roughly 6-8 glasses per day, but you may need more or less depending on your size and lifestyle.